Virtual worlds are about people, not just things. We (people) make things for ourselves and for our friends (also people). We give things away or sell things--to people. Here are a couple of examples. in Kitely: paste into Nav (top) bar of Firestorm, Enter. The Hypergrid WIP Show is a one hour show of works in progress or recently completed. Everyone is invited. Building, scripting, promotion, entertainment-- whatever you are working on. Shows are held twice a month, on the second and fourth Sundays at noon Pacific time (USA). Presentations are in voice and text. For text presentations, best bring the text in a notecard and paste it into chat. Voice presentations may be captured in video. Stills and videos from the show may appear in this blog and elsewhere. In a virtual world, your deodorant never fails. The History collection in Kitely. Serene Jewell recently organized a history month in Kitely. One part of that was a history hub with walkin teleports to worlds with a historical connection. The worlds and the history hub may persist indefinitely, so they may continue to be resources to educators and others interested in history. Here is a summary of what is available as the history month ends. MOSES, a US Army group that uses OpenSimulator software, has called for a foundation to plan and support the development of the OpenSim community. Here (not speaking for Moses) I suggest some things that such a foundation might do or support for the benefit of the entire OS community. Perhaps MOSES is mainly thinking of software, but I have in mind a much wider range of activities. NMA does not have the personnel to function as such a foundation on its own. NMA would be interested in working with other organizations or people on this. I am in conversations with MOSES people about their plans. I am CEO of New Media Arts, but in my blog articles I am speaking only for myself. 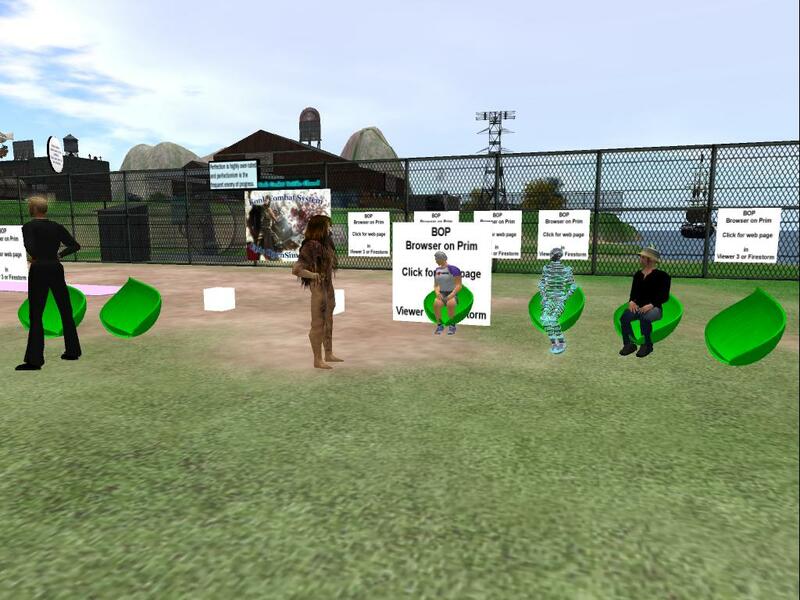 After the break: Possible services of a Foundation for the OpenSim Community. 2016 EDU: PEOPLE: At Spanish Language Learning at Escape--El Dia de Los Muertos. Nov. 2 at 5 PM Pacific. El Dia de Los Muertos --event notice. Nov. 2 at 5 PM Pacific. we are celebrating the Mexican holiday of Día de Muertos with a cultural exhibit, trivia game with prizes and fiesta. 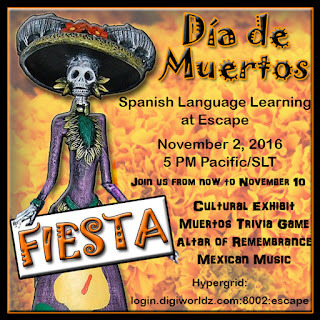 The exhibit and game are available now in the Casa de Cultura and the party will be Wednesday, November 2 at 5 PM Pacific/SLT. There will be Mexican music and dancing in the cemetery. All are welcome! Poetry in multimedia presentation, with video shot in a virtual world and music in accompaniment. "Unmindful" is the 19th machinima collaboration between filmmaker Natascha Randt and poet/creator Karima Hoisan. 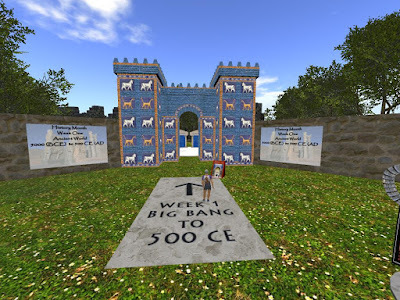 Filmed on Kitely-Virtual Worlds on Demand, on the world,, "Unmindful" built by Karima Hoisan and scripter Dale Innis. Thanks to the composer Akoviani, for permission to use his beautiful track, "Ariel" from his album, " Hypnotica"
This week the Short Poetry Workshop will be doing a fun group poem called Roll-a-Poem. Each poet rolls the “die” to get the number of words they will use for their line in the poem. So come down to the Short Poetry Library to learn, write and share. Araucana, exiles of the galaxy, HG safari. 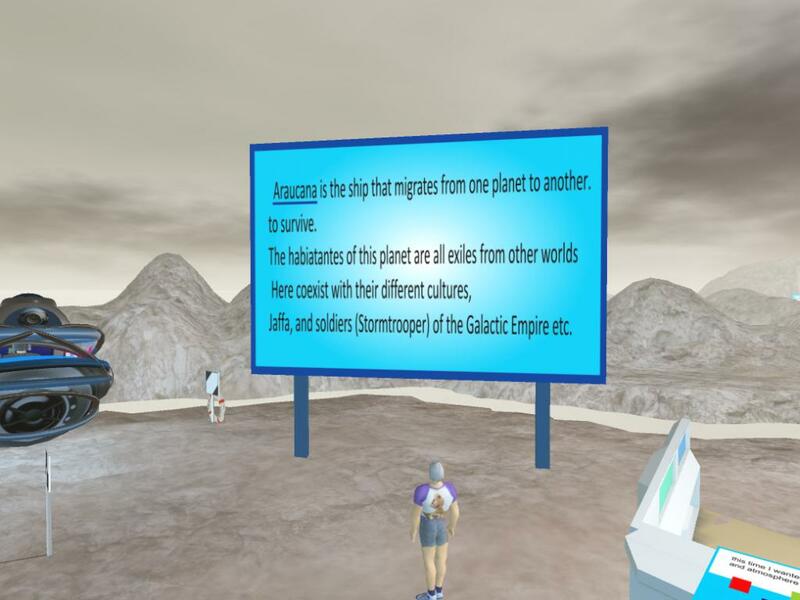 Science fiction fans are naturally attracted to user-built virtual worlds, partly because they are interested in future tech and partly because, as users, they can build worlds to display their interests. In Arucana, a fan with wide interests brings together a pantheon of science fiction themes. HG Safari visited there and here is what we found. I was not able to get there the first time I tried, so it pays to keep trying. New Media Arts is seeking to organize a group of OpenSim community members willing and able to represent all interested stakeholders in the community. Here it offers a web-page for people to volunteer efforts in particular areas. If credible plans are developed, NMA will seek ways of funding projects based on those plans. NMA has approved $1000 for a project to organize a group that will prepare credible plans for the future of open-source virtual worlds as they expand to serve a much wider audience. Such plans would form the basis for an effort to get nonprofit funds to support more rapid development of open source virtual worlds. Railways are scarce in OpenSim, apparently because of problems with the physics engine. A few people seem to be finding solutions. Here is a video of the work of one of these people. Go to Steam city via world map. OpenSim does not have a viewer in the browser (VIB) yet, but people are working on that. 2 demos show that it is possible with worlds that function like a limited version of OpenSim. Assuming it can be done, what would we do with it? Here is a bit of speculation about how communities might use it to foster their growth. Web page offers avatar choices fitting the community. Viewer in browser (VIB) entry is to main community world. Community has activities there as much as possible. Or has walkin TPs to other places. Web page gives complete instructions on what to do after entry. 2016 WRITE: HG: Hogwarts Forever: Roleplay in virtual worlds is writing in draft. Does writing create magic? Roleplay in virtual worlds is writing in draft. Metaverse tours visited Hogwarts in the virtual world of Kitely. I got a few pictures. Of course you know about virtual worlds. Fiction is about virtual worlds. Movies are about virtual worlds. 3D software like OpenSimulator is about virtual worlds. The thing I like about OpenSimulator software is that I can visit those virtual worlds with my friends.